1. From the Director of School Education, Telangana, Hyderabad, T.S., Hyderabad Lr. Rc.No. Spl/MDM/2016, dt: 16.06.2016. 2. G.O.Rt.No.200, Finance(EBS.IV)Department, dated 19.07.2016. ORDER: In pursuance of the circumstances reported by the Director of School Education, Telangana, Hyderabad in the reference 1st read above and Budget Release Order issued by the Finance (EBS.IV) Department in the reference 2nd read above, Government hereby accord Administrative Sanction for an amount of Rs.109,40,20,000/- (Rupees One Hundred and Nine Crores Forty Lakhs and Twenty Thousand only) to the Director of School Education, Telangana, Hyderabad, under Plan from the BE provision 2016-17, towards meeting the expenditure of egg cost for providing three eggs per week to the students under Mid Day Meal Scheme during the year 2016-17, in relaxation of Quarterly Regulation Orders to the extent of total Budget Provision in BE 2016-17, under the Heads of Account mentioned in the reference 2nd read above (copy enclosed). 2. The Director of School Education, Telangana, Hyderabad shall take necessary action accordingly. Sub: Mid Day Meal- Provision of one more egg in addition to two eggs already providing two days for a week under MDM -Reg. Ref: From the Commissioner of School Education, AR Hyderabad. Lr Rc.No.100/MDM/2016, dt:27-06-2016. In the circumstances reported by the Commissioner of School Education. A.R. Hyderabad vide reference cited after careful examination of the matter. Government hereby accord permission to the Commissioner of School Education. A.P Hyderabad to provide one more egg in addition to two eggs already providing two days for a week under MDM subject to meeting the expenditure within the budget. 2. The Commissioner of School Education. A.P., Hyderabad shall take further necessary action accordingly. 3. This order issues with the concurrence of Finance Department vide their U.O. No 41022/41/2016. dated: 03-08-2016. 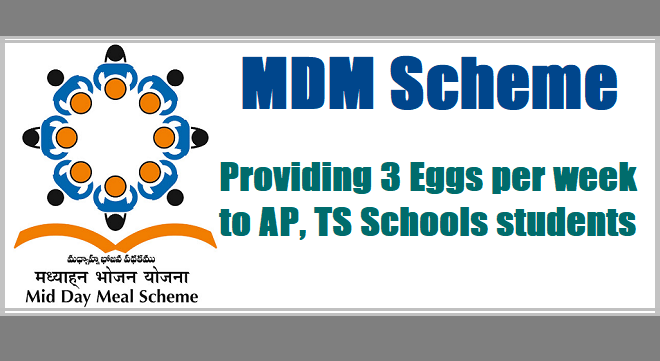 DEO Warangal News: All MEO"s are informed to implement the (03) Eggs per week to the students of PS/UPS/ IX-X classes under MDM scheme from 01-09-2016 and budget also released to all MEO's. All MEO's requested to draw and disburse the amounts as per instruction of DSE,TS.,Hyd.